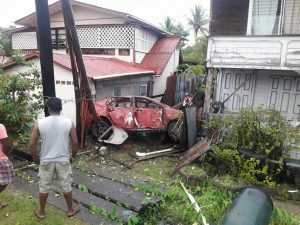 The car that struck down a 60-year old Keith Redmond of Bagotville, West Bank Demerara. A pedal cyclist was killed early Sunday morning at Pouderoyen, West Bank Demerara after he was struck down by a speeding motorcar whose driver was allegedly under the influence of alcohol, the Guyana Police Force said. Dead is Keith Redmond 60 years, of Bagotville, West Bank Demerara. Traffic police investigators said about 5:15 AM, PMM 1895 driven by a 37 year old, resident of La Parfaite Harmonie, West Bank Demerara, was proceeding south on the Pouderoyen, Public Road allegedly at a fast rate, when he lost control and struck Redmond who was proceeding in the same direction. The pedal cyclist was taken to the West Demerara Regional Hospital, where he was pronounced dead on arrival. The body is at the hospital’s mortuary awaiting post-mortem examination. The 37-year old driver of Parfaite Harmonie, West Bank Demerara. 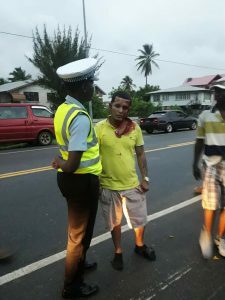 Police alleged that he was speeding and driving under the influence of alcohol when he struck down Keith Redmond at Pouderoyen Public Road, West Bank Demerara. Redmond was pronounced dead on arrival at the West Demerara Regional Hospital. The driver is in custody assisting in this investigation. A utility pole was broken by the car that ended up in a yard and Redmond’s motionless body was seen in a nearby gutter.